Technology and innovation have forever altered the relationship that consumers have to content and have reduced the control that the music industry wields over how music is heard and bought. With such easy access to immeasurable volumes of music online, consumers place less value on the traditional recorded music product than they used to. It may not seem fun now, but it will be. While new ways to access and experience content are the causes of the industry’s woes, they also present lucrative opportunities. Record labels have huge catalogs of timeless recordings and continue to produce new material beloved by music fans worldwide. They just need to present their music differently. So how to start? Two years ago, after spending many years as a digital strategist and producer at ad agencies working with global brands, I started designing new digital entertainment products with record labels and artist managers. At great ad agencies, an R&D spirit flows relentlessly. They’re on fire with great, smart ideas and they manage the development process well: research, analyze, brainstorm, design, test, build, launch, repeat. But I’m not seeing much of the R&D spirit in the music industry. Let’s light that fire. When digital and online media emerged as a primary communications channel and fragmented the entertainment market, advertising strategists redoubled their efforts to identify consumers most likely to buy their products. We learned who they are, where they spend their time and what they like. The new media world necessitated a new connection strategy. Advertisers started having conversations with consumers and built experiences that bridged the numerous media channels where consumers spent their time. Fostering conversations reflects the participatory nature of the new media environment. The experiences are multimedia, multi-channel, often entertaining encounters where the value, in part, is in the good feeling consumers get from engaging with the experience ¬- even if it is a well-disguised ad. Next, start a conversation with your audience. 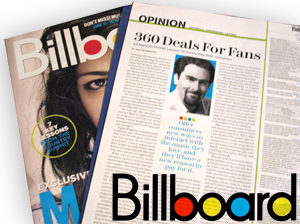 In the music business, “360 deals” refer to single companies consolidating services and getting a piece of every slice of artist revenue. In advertising, the 360-degree concept describes the multi-channel communications eco-system where you connect with your audience. The idea is to start a conversation with the consumer in any one channel and continue it across all the channels where the consumer encounters your product. Then move from having a conversation with a consumer to building a relationship. A 360-degree deal for consumers is the experience through which you cultivate the relationship, and into which you integrate new types of products, for example music video games or online virtual concerts. The 21st Century Fans loves the richness of these multi-dimensional encounters: an email to fans sends them to a Web site promoting a new album. The site hosts a fee-based online game designed around the album. The game connects to the band’s Facebook page, where visitors can enter a contest to win concert tickets and where a sense of community is fostered. Marketing messages and calls-to-action are seamlessly integrated. Offer consumers new ways to interact with the music they love, and they’ll have a new reason to pay for it. This is where it gets lucrative: new product types create new business models and bring new revenue sources. Use the new product to drive attention to your existing products. Identify your most loyal fans and create a fulfilling subscription offering. And bring in the brands. If you can corral a bunch of your fans together (whether on tour or online), there are brand marketers who want to be there too. If done well, fans don’t mind because this group is already predisposed to like, say, Chevrolet, and because fans are winning cool prizes (“Find the ‘golden ticket’ in the game, and you could win a brand new car!”). Chevy’s getting the benefit of millions of consumers spending hours of time within this co-branded multi-channel experience. For you the benefits are many, including the brand’s contribution to your R&D effort and new product launch. Remember, you have what we all want: awesome entertainment, great talent and decades worth of content. Develop a 360 relationship with consumers and put a new music product at the center of it. Give consumers new ways to interact with the music they love, and you give them a new reason to buy. Adam Blumenthal is founder/CEO of Curious Sense, a digital product design studio that produces games and apps with entertainment companies. Who Art Thou, Chief Digital Officer? Facebook Acquires Occulus Virtual Reality for $2B – Is your Social Network going 3D? Hey Brands: Get Your Game On!